BugBlog: A digital natural history notebook? 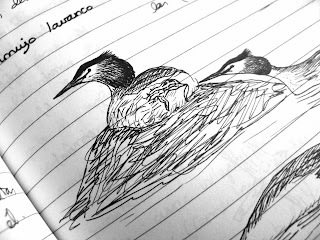 I have taken notes about natural history on and off since I was around 12. I got my first binoculars as a present, and a new world opened before me. In more than the usual sense of being able to see things far away, as I was also shortsighted. I got my first pair of glasses shortly afterwards and the whole world become focused. 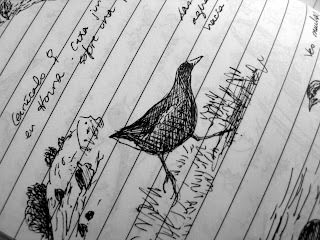 Taking notes and making sketches of animals I saw, mostly birds from the local park but also reptiles or amphibians slowly become my natural history diar y. I used to make the books myself, and they were monthly in my teens. I then upgraded to good quality yearly notebooks. I made line drawings and, during the summers, I had enough time on my hands to draw in them careful watercolor sketches. When faced with the need organise records to be able to go back to them I made a card file cabinet. In 2001 I got my first digital camera. With it came a new way of recording natural history sightings: even a poor quality photo is often better than your memory when trying to identify beasts. Digital photos have a date and a time, which allows for searches and immediate organisation. I then had a written notebook and photos, but little link between then. I like making my records public if they can be of any help, so, when I had to do this, it meant going through the notebooks and transferring the records onto the computer. I hope that writing a blog will be my latest upgrade in natural history recording: fully searchable and with less chances to getting lost than a precious notebook, a unique copy with all the year events. However, I am not completely sure I will stop scribbling things onto paper...as yet. Thanks again Jane! I wish I had started earlier, I love blogging. I was going to use the blog as my notebook, but my notes are not very elaborated, so I use EverNote as my diary now, and the more interesting things I work a little bit more and post them in my blog.